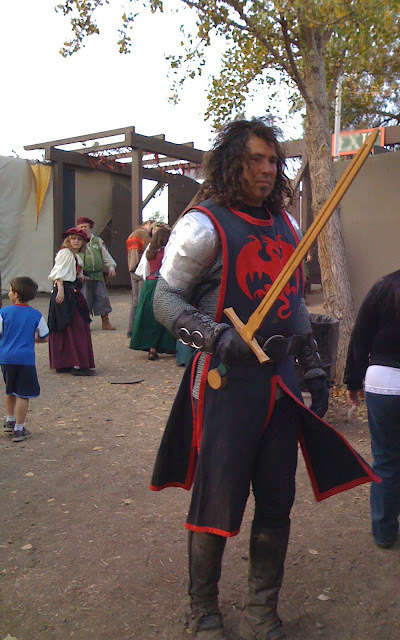 Earlier this month, we went to the NorCal Renaissance Faire at Casa de Fruta. (I can hear my little brother rolling his eyes from here...land of "fruits and nuts" indeed...) This weekend is the last one for the year. Attending one of these is Geek Mecca....right up there with Star Trek Conventions! Though lots of "straight" non-geeks attend too. We had lots of fun, as usual. As the boys get older, we find we experience different things as their interests change year over year. I have to give a thumbs-down to the turkey legs this year. They are SO expensive, and we got 2 that were undercooked. Very disappointing--I don't think Henry VIII would have tolerated that, but we did not have the option of ordering anyone's head cut off for the offense. Studly men carrying swords...even if they are just made of wood. I love it when these guys come and banter with my boys. Of course this moment cost us the price of a new wooden sword for Teddy, who was not satisfied with his wooden dagger from previous years. 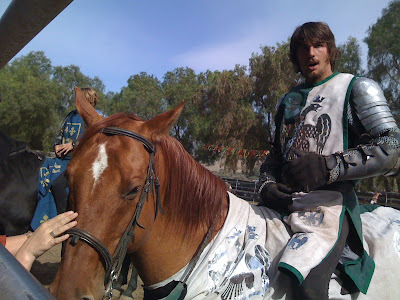 And then there was this young man below, talking with the crowd from atop his horse after a rigorous joust. I'll post more about the boys' first fencing lessons next week sometime. What other period re-enactments can we find? There are a variety of themed dinner theatres, from Medieval Times, to Pirate Dinner Adventures, and Arabian Nights. Active Civil War re-enactments in Santa Cruz. Dickens Faire at Christmastime. Comment below and tell me what you've seen and done!